Partho had proposed two options—either we go to Zugspitze or Salzburg. 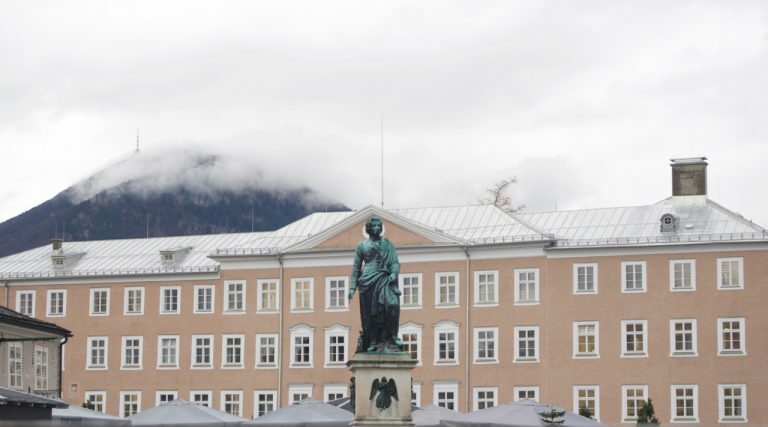 The weather at Zugspitze was sub-zero, which, in a way, made Salzburg a default choice. 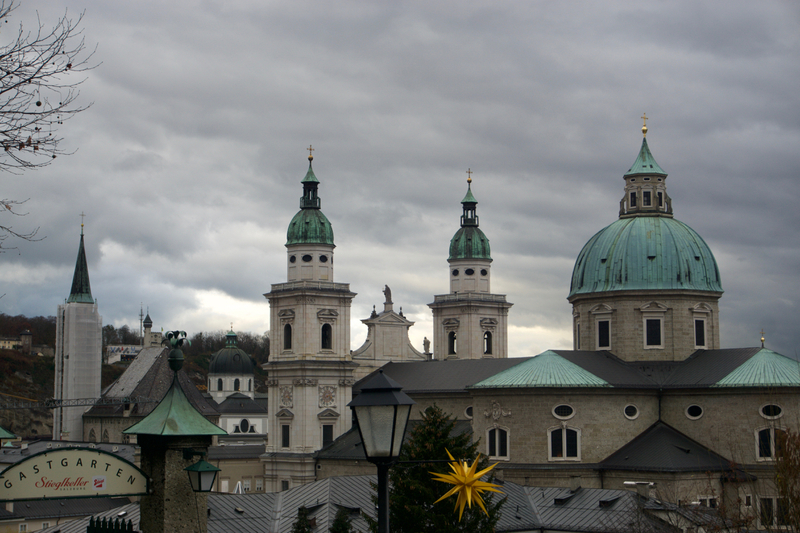 One of the cheapest ways to visit Salzburg is to go in a group of two to five people. The railway station comes under the “Bayarn Ticket” zone even though Salzburg is technically in Austria. This was a 24 hour pass for traveling all around Bayern region including the “Munich inner ring”. A single ticket is 26 Euros but each additional person is charged 5 Euros (upto a total of 5). Partho had some irritation in his throat. He insisted that he would visit a doctor once he was back in Stuttgart the next day. Instead, he kept himself warm by drinking a lot of hot chocolate and coffee. 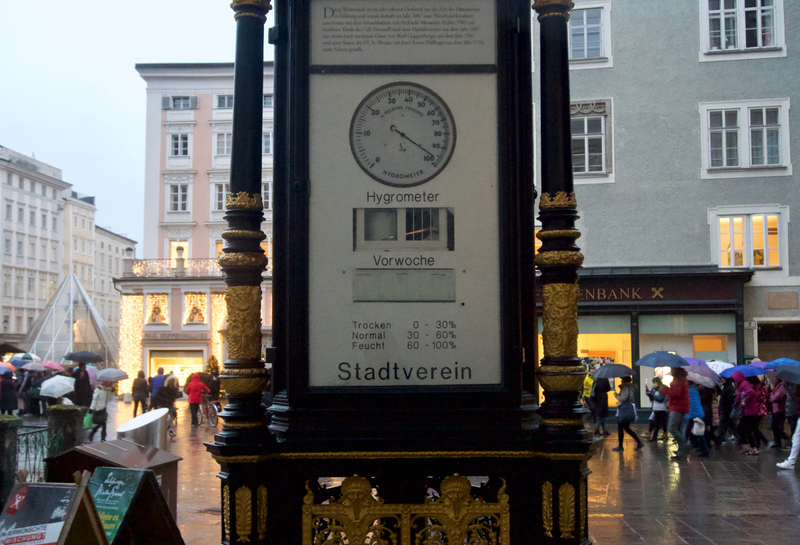 By the time we were in Salzburg, it was raining pretty heavily. Although the whole city can be explored by foot, we decided to get a 24-hour bus ticket. Walking around in rain wouldn’t have been fun. Partho’s spoken German is close to a native speaker (a guy we met in Salzburg, Maximillian, later told us). This had given me some advantage over the last few days, especially with asking for directions. Today it gave us an opportunity that I wouldn’t have thought of. A lady approached him while he was about to take a ticket. She had a 24-hour ticket and did not need it anymore. (It was already 2:00 PM.) Partho bargained and got a 4 Euro ticket for 2. There is a set of analogue meters displaying temperature, pressure and relative humidity right in front of the weather station. It was raining heavily and everyone had taken out their umbrellas. 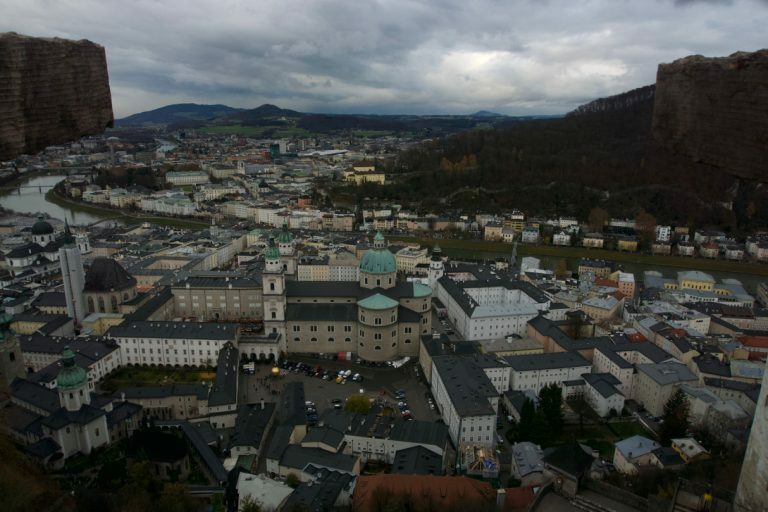 Salzburg is a touristy place. 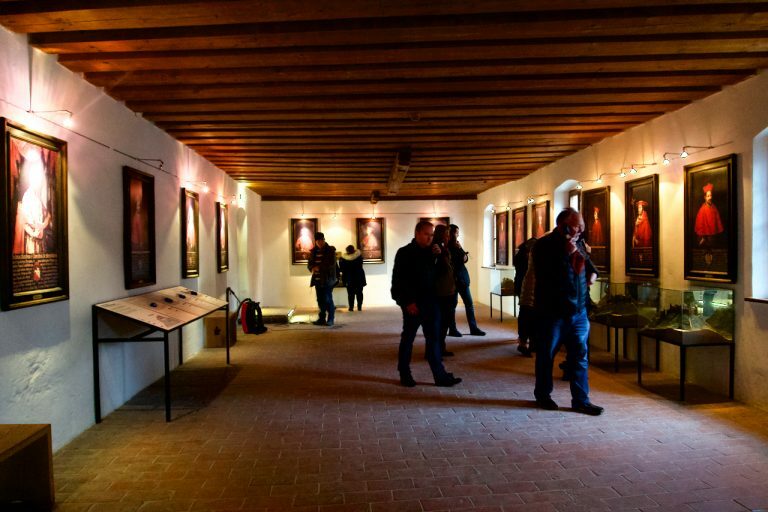 It draws its crowd for being the birth place of Mozart and having the unconquered Hohensalzburg Fortress. Mozart’s statue at the square. 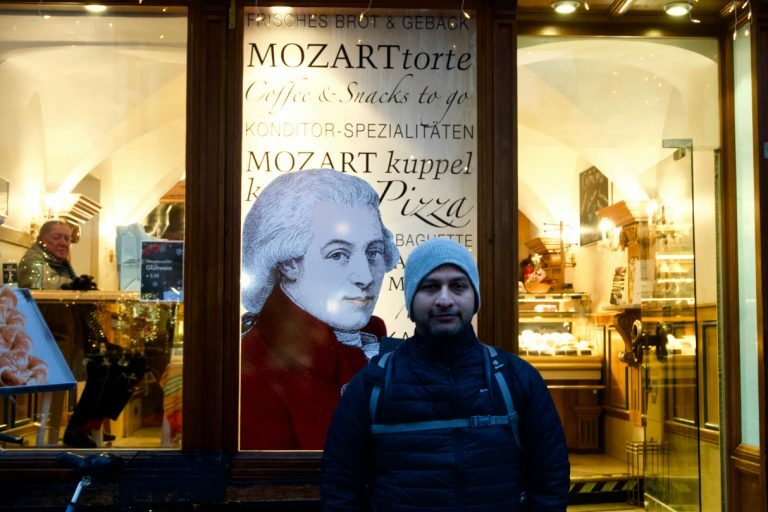 Partho posing in front of a bakery carrying Mozart’s name. I tried the Austrian Leberkässemmel sandwich here. Horse carriage for tourists. 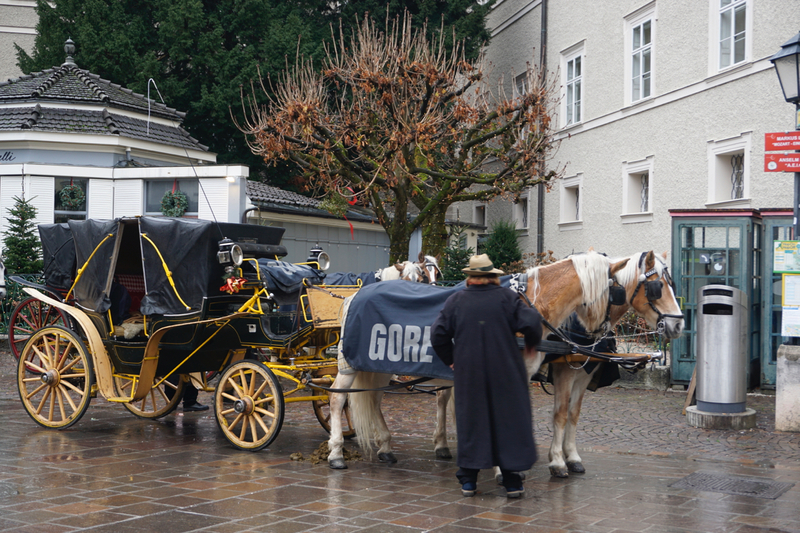 I did not know that Gore-Tex was used for horse rain sheets. The fortress is worth a one time visit, just for the view of the city from its tower. Still, I had to pay for the basic ticket that included the stable, the torture chamber and an audioguide. Partho decided not to enter. I could understand later once I had seen it all. For example, the torture chamber was just an entry to the dungeon and a place to store restraining devices. All the thirteen archbishops of Salzburg. The states of the castle during each archbishop’s reign are displayed as 3D plaster models. View of Salzburg city from the high tower of Hohensalzburg fortress. 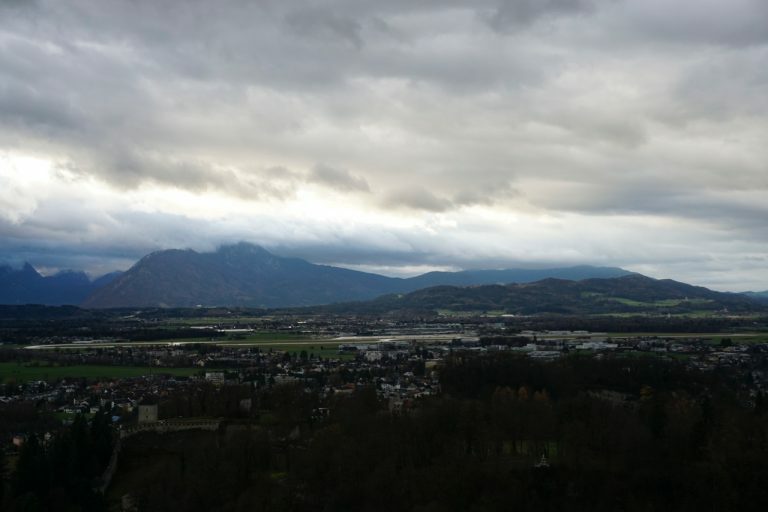 View of the alps from the tower. 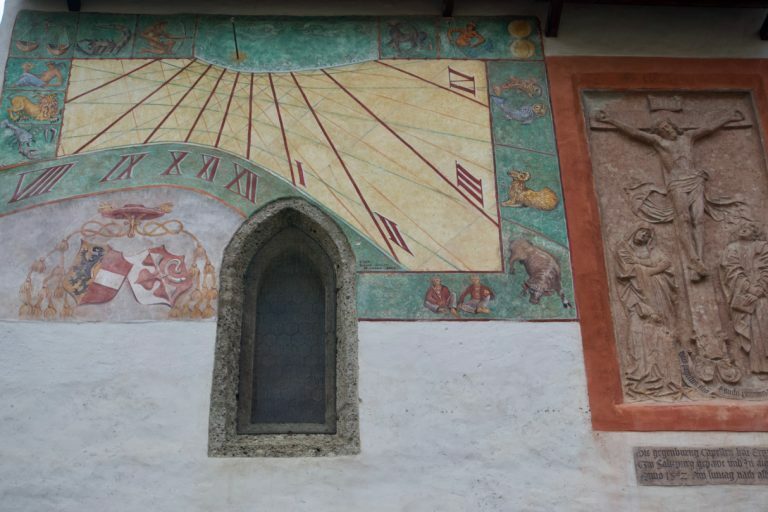 A sundial on the wall of the Chapel of Archbishop Leonhard von Keutschach. We took one of the regional trains (RB) and made our way back to Munich. We were back at Rupanjan’s place by 8:00 PM. He was still busy with his assignments. Life as a student in Munich was hard. 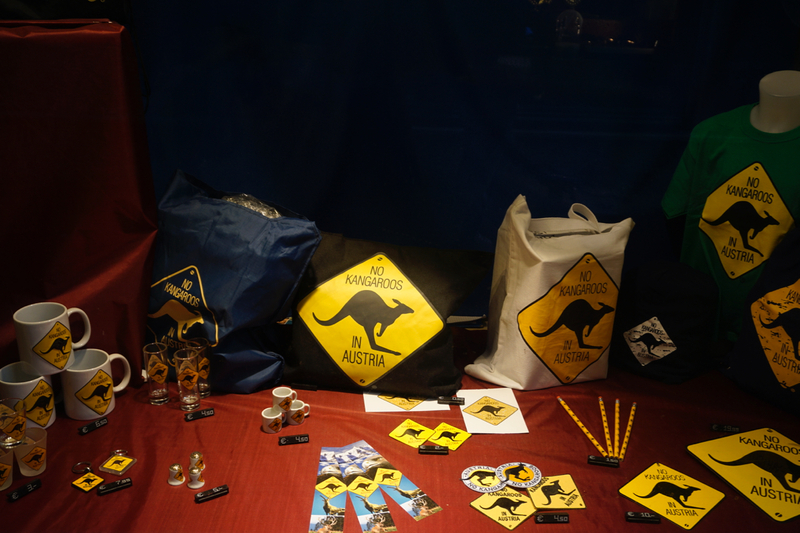 Just for the record, Austrian’s have a sense of humour.